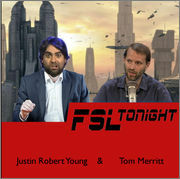 FSL Tonight, is a podcast hosted by Justin Robert Young and Tom Merritt. The show is centered around a fictional sports league, the FSL, featuring teams and players from various sci-fi and fantasy series like The Lord of the Rings, Star Wars, and Firefly. Since Tom and Justin are gigantic dorks for the stories and characters involved in the league, the show is laden with comedic references to the teams' back-stories. The show's format is similar to many real-life fantasy sports shows in that they talk about the previous week's games as well as the upcoming match-ups. However, unlike most podcasts, FSL Tonight is actually mostly scripted and, besides the episodes recorded at live events like Nerdtacular and Dragon Con, every episode is pre-recorded and released later. The podcast fictionally "airs" on the radio network, "Dragon SportsTalk Radio." Justin has described the podcast as being the nerdiest thing he has ever been involved with. Since the show is a mixture of sports and sci-fi/fantasy the show caters to a very small audience, however there are a good number of very passionate fans. Many episodes include guests appearances by many of Tom and Justin's geeky friends like Scott Johnson, Paul and Storm, Len Peralta, Scott Sigler, and Veronica Belmont. Most of the time the guests are playing a character, such as a reporter, a fan or even former league commissioner, Stan Lee, or current commissioner, Hari Seldon. Brian Brushwood has been known to serve as play-by-play announcer on occasion. The 2016 season ran later than usual, starting August 14 and ending November 5. As of Nerdtacular 2017, there has been no announcement about a 2017 season. Asked about it during a panel at the event, Tom referenced a strike. The show is hosted on Scott Johnson's Frogpants Network. Scott also created the "Dragon SportsTalk Radio" stinger and the FSL dragon logo. The coverage of the final game of the season is often recorded live. The first season's broadcast was hosted by the "BBLiveShow Network". This page was last modified on 3 July 2017, at 16:15.